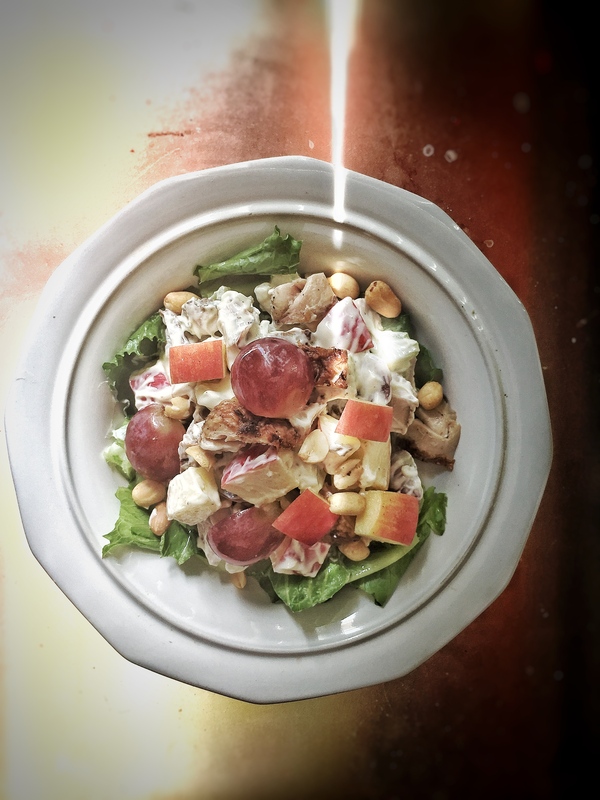 Make your life simpler with this Jerk Chicken Waldorf Salad . One of the things that living in 3 countries in the space of 6 months has done is force me to adapt. I half jokingly tell people that God is teaching me how to land on 4 feet like a cat (and perhaps have as many as their 9 lives- or more). Every move has its own changes and massive adjustments. This last one had by far been the most challenging but as a certified coach I know one thing about challenges- they offer us opportunities for growth. The greater the challenge, the greater the opportunity to grow. Whether we make ourselves fully available and committed to taking on all the revelation and transformation that are presented in these opportunities is completely up to us. One of the major ways of surviving change is to simplify your life. Strip away the things that are way too complicated and pretty much go back to the basics. I no longer have a in-home help as I did in previous countries and I am homeschooling a toddler and sometimes get overwhelmed by the magnanimity of all I have to do… including ministry, entrepreneurship (more on that in another post), home school, child care and all that housework that never ends… and I find myself further challenged with balancing to find enough time and energy for self care. I still want to create the majority of my meals from home but they have to be even more practical for me than ever before while still being tasty. Meals that do not require much cooking are an added joy. That instantly means no pot to wash up. A one dish meal? I am ALL in!!!! I also try to do batch cooking so that I can have a collection of cooked items that I can put together during the week. 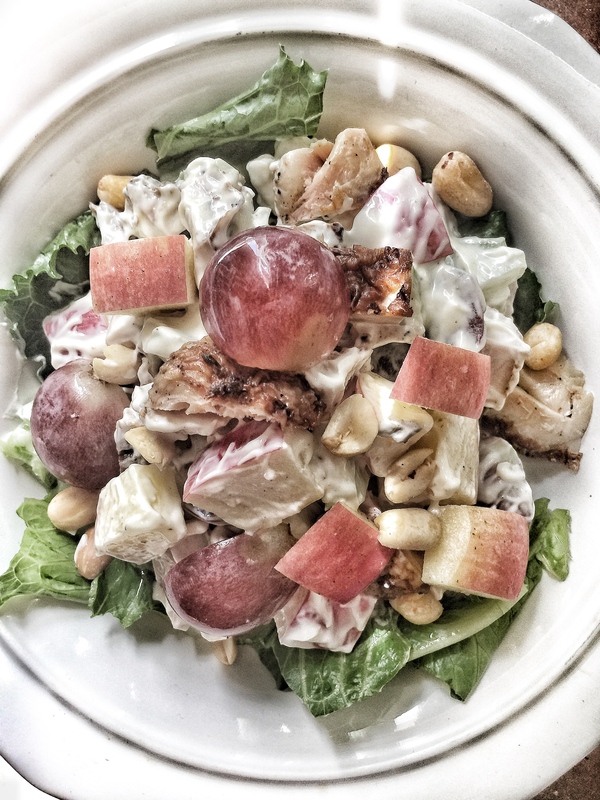 After cooking a batch of jerk chicken on the grill using our Chef and Steward homemade jerk seasoning recipe, I had the brilliant idea to make a Jerk Chicken Waldorf Salad. 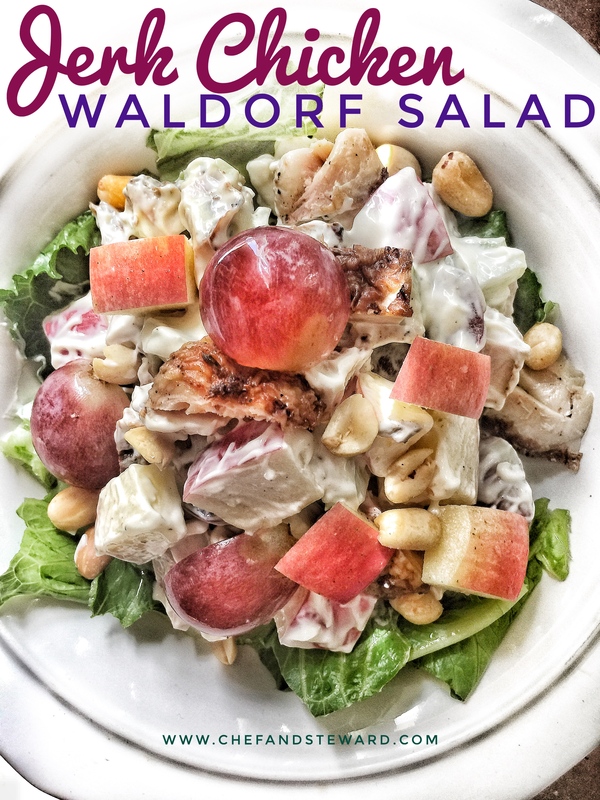 I created a Chicken Waldorf Salad Recipe on the blog years ago but this one would be different. This my dears is the Jamaicanisation of the classic Waldorf Salad. Chef Lij used to create such delectable fine dining versions for his flagship restaurant at the Waldorf Astoria Ras Al Khaimah but this a practical version for the keen, prolific, expert, and newbie home cook. 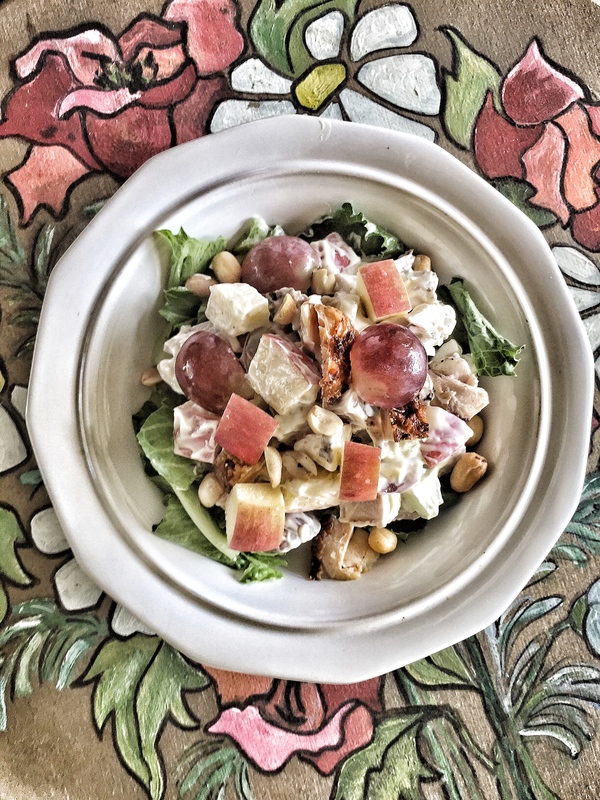 This is the Jamaicanisation of the classic Waldorf Salad. A great summer salad as a meal. combine, add mayonnaise, salt and pepper to taste to serve. CLICK here for other great JAMAICAN flavours and recipes! By the way, our friends from Waldorf Astoria and some of our favourite Dubai food friends have been nominated for awards in the BBC Good Food ME Awards 2017. We were nominated for three years in row ourselves (both Chef Lij and Chef and Steward blog) and won some awards and this year we pass the mantle on to some deserving influencers. Please take a few minutes to show them some love by voting for them. Love this! I love cold chicken salad mixes for summer time. I just made some this week, adding summac and dukkah for a localized touch. I still have some jerk seasoning in my pantry. Going to try it for sure! Yes Yvette, cold salads are perfect for the heat. You are gonna love the nice spicy notes of the jerk with this salad! I made it today, and made a homemade buttermilk-style dressing with Laban to go with it. So good! Thanks for coming back and sharing that you made it! Yours sounds lovely!